For one New York family, it’s a very special holiday as 7-month-old Vincent Bono celebrates his first Christmas. His parents say it’s much more than a milestone — it’s a blessing. “My pregnancy, I was worried everyday,” mom Nicole Bono recalls. Baby Vincent was born with a type of craniosynostosis, a rare birth defect that causes a ridge on the forehead. For some children, surgery is necessary to allow the brain to grow and develop normally. “If it’s not fixed in infancy, it becomes a deformity that really limits their ability,” Dr. Michael Egnor, professor of neurosurgery at Stony Brook Medicine, told CBS News. Egnor and his team reconstructed Vincent’s skull with the help of 3D printing technology. With the help of CAT scans, they created 3D-printed models of Vincent’s head, allowing doctors to explore the “before and after” from all angles. “The 3D modeling technique makes the operation considerably safer,” Egnor said. Doctors also used the models to practice taking the skull apart, removing the deformity, and putting it back together again, allowing for more precision. Experts say another benefit of using the 3D technology to prepare is that the surgical procedure can be shorter, which means less time under anesthesia. For Vincent’s parents, it was a nerve-wracking five-hour procedure, but the results made it all worthwhile. 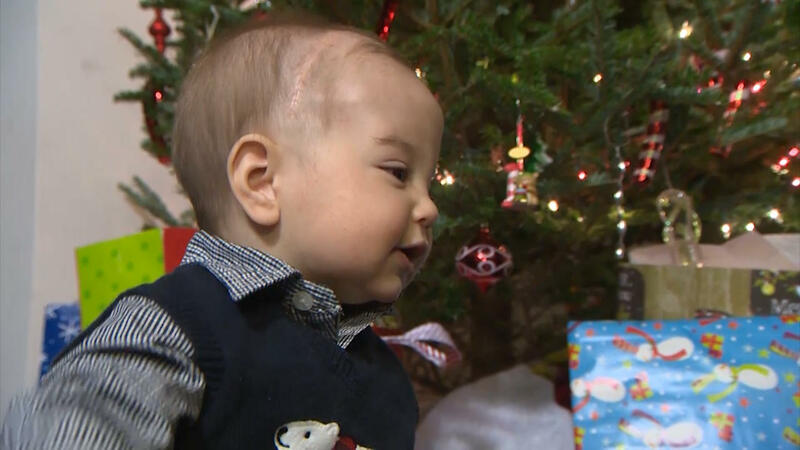 “The surgery went well, so we are very thankful for that,” father Mark Bono said, as little Vincent bounced in his lap in front the Christmas tree.